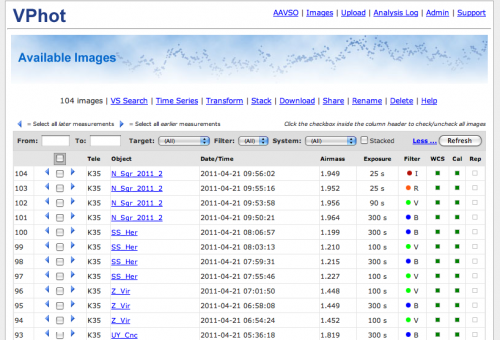 All VPhot processing is done via a web browser. All of the basic photometry tools exist (stacking, time series analysis, control of annulus, transformation, etc.) and the algorithms have been rigorously checked and confirmed to be of the highest quality. Results of the processing are automatically exported in AAVSO Extended Format, meaning you can directly load them into our database via WebObs without having to make any changes to the data file.